This week, I had the privilege, as President of Global Kinetics, to speak at Tigo Business Forum 2015 in Guatemala City (hub.tigobusiness.com.gt; #tbf15). This is an annual symposium where Tigo Guatemala (www.tigo.com.gt) hosts a networking event aimed at regional CEOs and CFOs to discuss key technology topics relevant to emerging technologies impacting businesses across the region. Last year, the theme was Big Data and this year it was Enterprise Mobility, Global Kinetics’ area of expertise. I had the wonderful opportunity to meet with many talented and innovative people and companies visiting from across Guatemala and Central America at large. 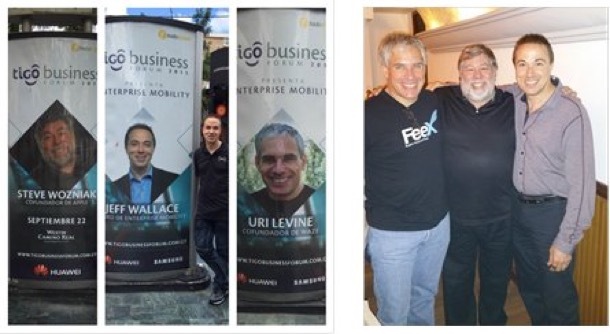 I was also able to meet, share a few meals with and co-keynote the event with both Steve Wozniak (co-founder of Apple; @stevewoz) and Uri Levine (co-founder of Waze; #urilevine). Each of these gentlemen are not just amazing for their respective technology accomplishments, but also humble, down to earth and simply kind, sharing beings. At the event, I was fascinated to hear about so much technology history as told by, and even created by, Woz – truly mesmerizing stories indeed. From Uri, I learned how and his partners came to create Waze – put simply, he hates traffic and thought that there just must be a better way. When he didn’t find one, they created one and later got acquired by Google for nearly $1 billion. Now, Uri is off on additional entrepreneurial journeys to solve similar everyday challenges in areas of fees, public transit, automotive repairs and air fares. Stay tuned for more great disruption from his efforts. There was such a high degree of excitement and passion among the nearly 1,200 attendees and the energy was, truthfully, beyond infectious. Throughout the day of the event I met with numerous regional press organizations and addressed a panel of local executives discussing business trends related to topics such as mobility, cybersecurity, user experience, internet of things, the sharing economy, regulation, innovation and more. And, I think I took more photos with fellow attendees than I have taken in many years! I need to spend more time in this beautiful country. Guatemala has great food, beautiful geography and warm, welcoming people. There is a broad and great hunger for knowledge about how best to leverage emerging technologies to achieve business benefits. There are respectable technical capabilities in the Central America region that could create great near-shoring opportunities for U.S. companies, given the proximity, time zone “friendliness”, language skills and competitive rate structures. As an example of #3 above, two wildly successful solutions, DuoLingo and reCAPTCHA, were developed by Luis von Ahn, a Guatemalan entrepreneur and an associate professor in the Computer Science Department at Carnegie Mellon University. I look forward to meeting and working with other such innovators in the near future. Tigo has a wonderful foundation doing amazing things to help modernize schools across the country to help children across Guatemala gain access to modern internet and computer technologies – a commendable undertaking that is showing awesome results. The family & friends of the family that owns much of Tigo Guatemala are fun, interesting and wonderfully hospitable people. With just this “too short” visit to Guatemala, and having worked with other offshore companies for several years, I can see how Guatemala’s future as a partner and collaborator in these technological areas looks bright and I am excited to engage more and more on these fronts with Tigo Guatemala and many other companies in the region, not to mention keeping in touch with Woz, Uri and many of the other wonderful people I met at the event.